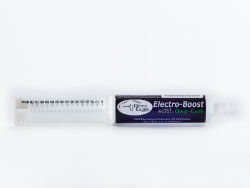 An oral electrolyte paste with Oxy-Cell to prevent muscle fatigue and dehydration. Improves stamina, respiration and allergies. Oxy-Cell develops a stronger, healthier respiratory system by strengthening the walls of the lungs, diaphragm, and chest muscles to do the work necessary to move large volumes of air in and out. It also allows more oxygen in the blood stream to burn the nutritional fuels for overall health and maximum performance. Contains octacosanol for increased muscle strength, endurance, vigor, quicker reaction and faster recovery times. Helps to maintain the health of red blood cells, along with having vitamins, minerals and amino acids, and electrolytes to help prevent dehydration, muscle fatigue, heat stress during tying up, and before or during activity. A nutritional source of energy before or after athletic events. Defense against respiratory allergies. Fast absorption even in sick and dehydrated horses. Each tube has 4 to 8 feedings. Administer 20 cc orally 1 hour prior to event. Use 10 cc for light activity or when transporting horse or as needed for hydration. Works well even on the trail. Vegetable Oil, Sodium Chloride, Potassium Chloride, Magnesium Sulfate, Wheat Germ Oil, Glycine, Silicon Dioxide, Calcium Carbonate, Zinc Proteinate, Manganese Proteinate, Copper Proteinate and Vitamin D3 Supplement.